The CPAP machine (Continuous Positive Airway Pressure) has proved to be the most successful treatment for obstructive sleep apnea sufferers. It is also very successful in cases of excessively loud snoring. The unit is a high quality medical air pump with suitable electronics, that enable it to deliver a very accurate and constant pressure. These are very reliable units and only need to be serviced once a year. Most CPAP units record how long it is used each night, so results can be analysed later. Air pressure on the pump is set just high enough to stop the airway collapsing during normal sleep. This is usually calculated after a sleep study. On some CPAP machines the unit can be set on a delay to start on low pressure, gradually increasing in steps, to allow the person to fall asleep before full pressure is applied. Some offer a choice of delay settings up to 30 minutes. The machine can sit on the floor or on a bedside table and requires a 13 amp socket outlet to power it. 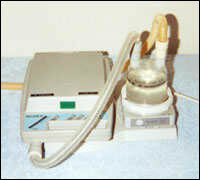 The pump is connected via flexible plastic tubing to a nasal or full-face mask. There is some noise generated, but this is minimal. CPAP machines are built to very high standards and are extremely reliable, but they do need servicing occasionally (at least once a year). There is a small filter that could become clogged with long use, especially if the unit is used on the floor. Some people (and I'm including myself here) find it difficult to get used to wearing a cpap mask for the first time. I found it helpful putting the mask on during the daytime and wearing it for just 15 minutes. Then gradually increase the time until you feel confident. You can sit in a chair and watch T.V. or read the daily newspaper. If you wear glasses, this can be awkward though. The first time you use your cpap will feel rather strange, as air pressure is forced (only slightly) into your lungs. If you're using a nasal type and you open your mouth, air will escape making it hard to talk. This can be rather funny. Chin straps are available and do work well. 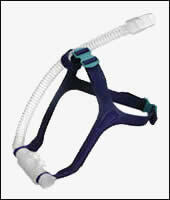 Before you actually get a cpap, your specialist will instruct you on how to use it and adjust the mask. If you're wondering what would happen if there was a power failure, don't worry as there's a fail-safe valve that opens if the pressure drops in the mask. You can breathe normally though this valve. 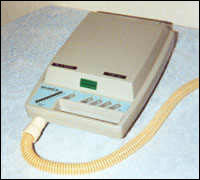 Cpap machines have been around for some time now and (as far as I know) there haven't been any mishaps. This is the most commonly used type. Easy to use and quite comfortable, despite it's looks. A chin strap is also available to keep the mouth shut whilst asleep, though most patients don't usually require this. 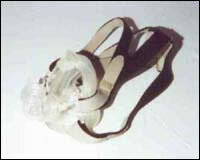 Some masks have a swivel joint connection to the tubing. This allows some movement by the person without twisting the tube, stopping it leaking. Problems are mainly leakages, especially jets of air directed towards the eyes and making them sore. This is usually caused by the wrong size, or if you're unfortunate enough like me, to have a broken or irregular shaped nose. 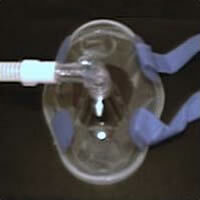 Using a nasal mask can also result in a sore or stuffy nose, and is common with patients suffering from allergies. The remedy for this is to use a heated humidifier which fits neatly at the side of the unit. It requires a 13 amp socket for power and is virtually a mini hotplate that heats the water in it. The temperature control is adjusted to give a gentle steam release. This also stops a dry mouth the next day. Water must be changed daily, the water being pre-boiled to sterilise it. A menthol preparation can be added to the humidifier if preferred, but don't put too much in. More than 2 drops will blow your head off. This type is used mainly for sleep apnea patients who have an abnormality or blockages of the nasal passages. All the new masks include a special safety valve to allow the patient to continue breathing should a power failure occur. When the pump is running, pressure holds the valve shut. In a power failure situation, as the pressure falls, the valve opens allowing normal breathing through that valve. The valve needs cleaning regularly as does the mask. The full mask is very claustrophobic to use for most people. The wide straps are very constraining, but they do have a quick release cord. The noise level can be higher with this sort though. This new mask is for use when all the other types are unsuitable (covers the whole face). The NHS don't like giving these out, as they use this type of a mask for hospitalised patients who may be in a coma. I was unable to use a nasal mask as my nasal passages are blocked, and couldn't get a full-face (pilot type) to seal due to my irregular shaped broken nose. I was lucky to be given this mask as it's very costly, and not generally available. It was a bit scary at first sight, but fitted perfectly and was extremely comfortable to use. It wasn't as claustrophobic as I thought it would be. Ideal for scaring the kids though, just joking. Nasal pillows are a pair of soft cones which fit inside the nostrils. These connect up to the CPAP machine in a similar way to the other masks. They are said to be more comfortable, but not widely used yet in the UK for some unknown reason, as they must be the same cost or cheaper than the other masks. 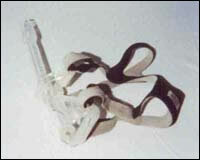 Shown here is the Mirage Swift Nasal Pillows system which is available from www.resmed.com and most NHS hospitals and Sleep Clinics in the UK get their equipment from them. These will connect up to your pipe work in the same way and they look really neat. I wish I'd had chance to try these out, but I have trouble breathing through my nose. It may be worth asking your Sleep Clinic to see whether these are available, if you're having trouble with a regular mask. From what I've heard from OSA sufferers in the UK recently, the NHS sleep clinics have such a large waiting list for patients requiring a CPAP machine, and are suggesting that you purchase your own machine and mask privately. CPAP machines and associated equipment are really expensive, though it may be worth considering this option for your health's sake. If you search the Internet for CPAP equipment, there has been a large increase of new produces that have become available to purchase privately, though you do need authorisation from a doctor or specialist. Most of these produces are from the US, and seem to be far superior (and cheaper) to what is available in the UK. If you use a reputable company, purchasing from the US is easy and fast, as they have a reputation to uphold.